Upcoming events. Check back for updates regularly. All are welcome. Event is free and open to the public. Screening will be followed by Q&A with Paula Madison as well as book and DVD signing. – Sun. Feb. 17th, 2019. Manhattan Chinatown Lunar New Year parade. 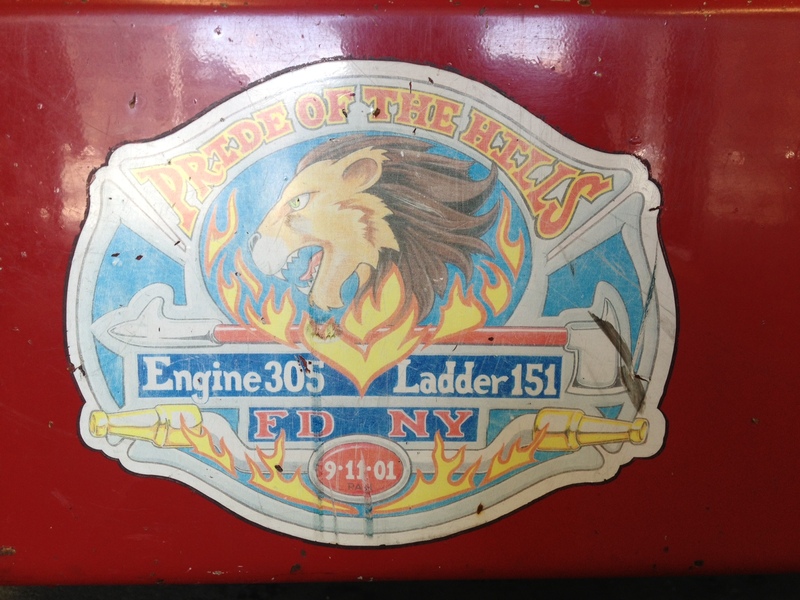 Meet at 11am with FDNY Phoenix Society at PS 130, 143 Baxter St. NY NY. Parade starts at 1pm .FHAA Parade day contact: Kaleena Ma. 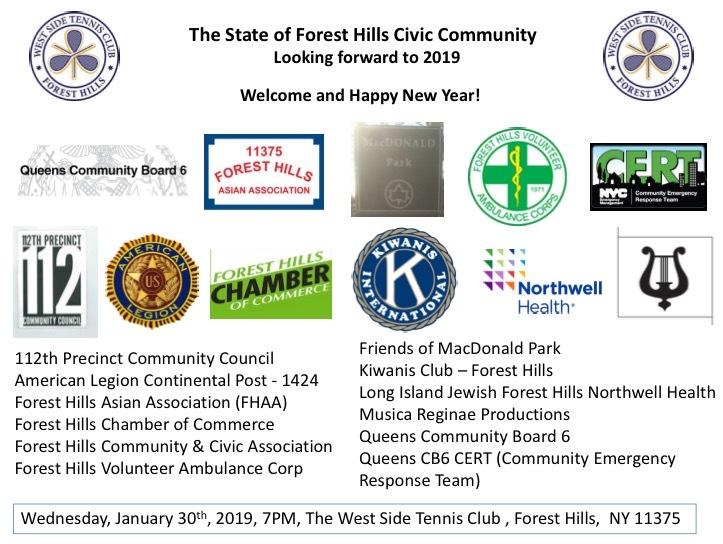 Come celebrate the New Year and learn more about various Forest Hills community organizations, their plans for 2019, and how to get involved. Elected officials who represent the community are also invited. All are welcome to meet and mingle. Admission is free. Cheese crudité and crackers and Cash bar. FREE PARKING IS AVAILABLE IN CLUB MEMBERS LOT FOR THE EVENING. DO NOT PARK ON THE STREET AS THE STREET IS FOR RESIDENT PARKING ONLY. The Fu Generation Foundation was created to support programs providing improved quality of life for the elderly, assist programs that encourage young people to succeed in their studies and their lives, and contribute to other selected non-profit organizations that serve the broad well-being or families. Corky Lee, Sons of the American Legion, Lt. B. R. Kimlau Chinese Memorial Post 1291, (www.ltkimlau.com/) to discuss: HR 2358 – Chinese-American World War II Veterans Congressional Gold Medal Act. (Chinese American Citizens Alliance), Corky Lee, as the Self Appointed at Freelance undisputed, unofficial Asian American photographer laureate will also discuss the May 2019 Sesquicentennial / 150th anniversary of the completion of the US Transcontinental Railroad and contributions of Chinese American railroad workers labor to those efforts. Thank you to Mario DiPreta, General Manager and CEO, The West Side Tennis Club for generously hosting. In existence since 1892, the West Side Tennis Club is the former site of The US Open and maintains 38 courts on four different surfaces. Event is free and all are welcome to meet and mingle. There will be giveaways and raffles. Cheese crudité and crackers and Cash bar. Thank you to our giveaway and raffle in kind donors thus far: Bruce Cost & Brooklyn Crafted, Flushing Ice Cream Factory, First American International Bank – a Division of Royal Business Bank, Bareburger – Forest Hills, KETTLE CORN NYC, Ridgewood Savings Bank – Forest Hills, and more to come. WEDNESDAY, JANUARY 30, 2019, 7PM, THE WEST SIDE TENNIS CLUB. 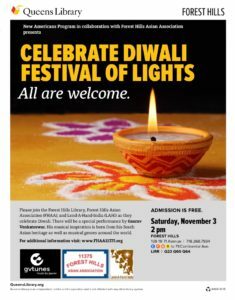 Come to celebrate and learn more about Diwali – Festival of Lights, our community marketing partner , Lend-A-Hand-India, and the Queens Library New Americans Programs and Forest Hills Branch upcoming programs. All are welcome. Event is free and open to the public. We look forward to your participation in celebrating Diwali. 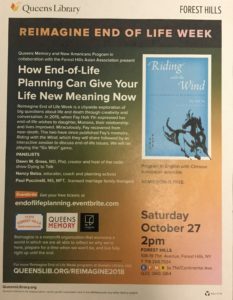 “Reimagine End of Life Week” is a citywide exploration of big questions about life and death through creativity and conversation. 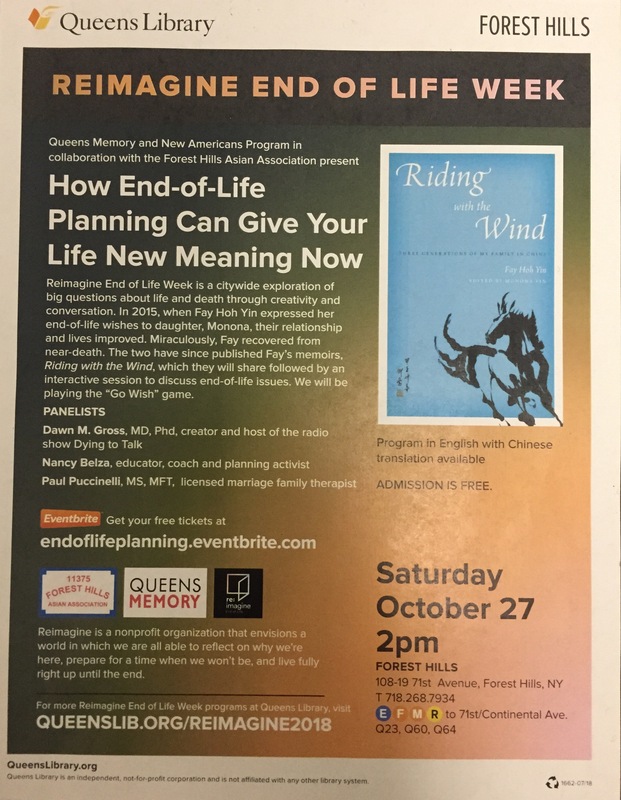 Fay Hoh Yin and her daughter, Monona Yin, authors of “Riding with the Wind”, will be in attendance. As will panelists, Dawn M. Gross, Nancy Belza, and Paul Pucccinelli. 2018 Community Advocate honoree: Heidi Chain, President, 112th Police Precinct Community Council. With a special storytelling and musical performance by Di Zhao. Di has performed at various venues in Europe, Asia, and the US including Lincoln Center and Carnegie Hall, and she is a great fan of mooncakes. Thank you to our venue host Ridgewood Savings Bank – Forest Hills. Opened in 1940, the building was designated a New York City Landmark in 2000 by the New York City Landmarks Preservation Commission. 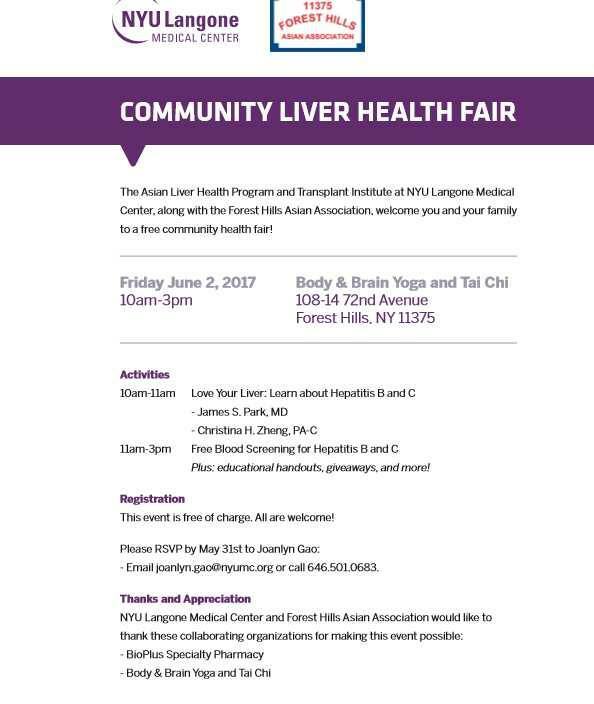 Forest Hills Volunteer Ambulance Corp. (FHVAC) will be join us again this year to check blood pressure for attendees and distribute info about FHVAC. There will be raffle prizes as well. Please email ED.FHAA11375@gmail.com if you would like to donate items for our raffle to raise funds for the association. The event is free and open to everyone. 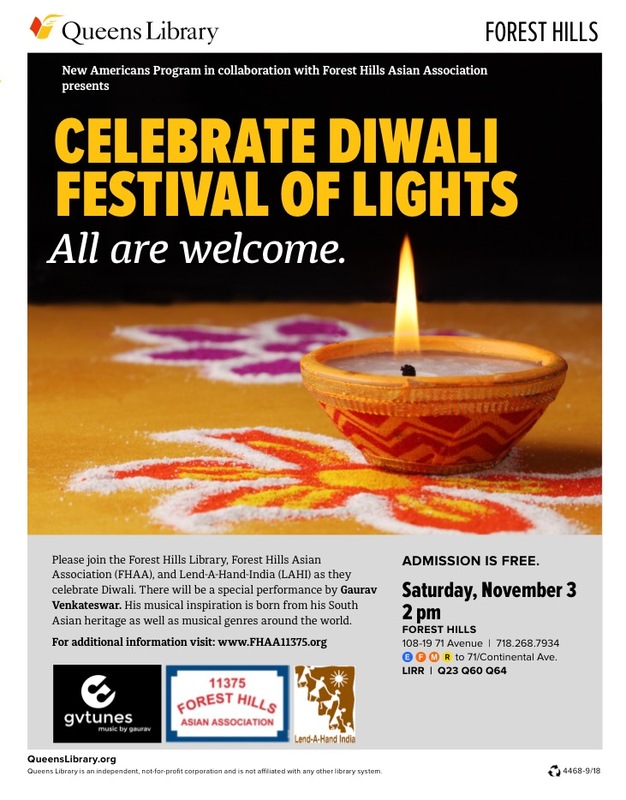 Also, save the date for our 1st Annual Diwali / Festival of Lights celebration. Sat. Nov. 3rd, 2pm-4:30pm. Queens Library Forest Hills Branch, 108-19 71st Avenue, Forest Hills, NY 11375. Email FHAA11375@gmail.com if you would like to volunteer and get involved. 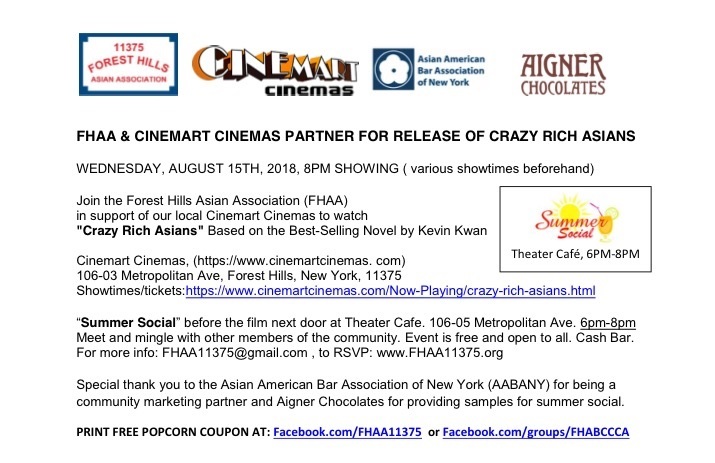 Come out to support the 1st major motion picture featuring an all Asian cast in 25 years (since Joy Luck Club) and look for our table to learn more about FHAA. Built in 1925, the Queens Historical Society gives the Cinemart the distinction of being the oldest continuously operated independent theatre in the borough. 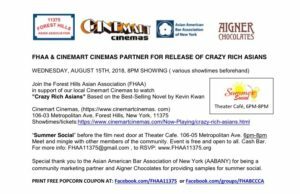 Come out to support your local independent movie theatre right in Forest Hills! Summer Social from 6pm-8pm before the film next door at Theater Cafe. 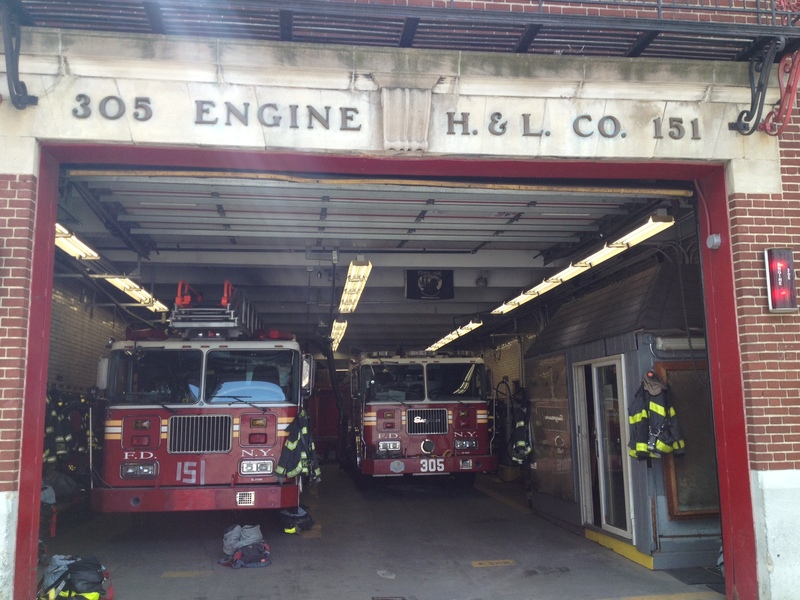 106-05 Metropolitan Ave, Forest Hills, NY 11375 on Wednesday, August 15th. Summer Social is free and open to everyone. Cash Bar. Limit one per ticket purchase. Good for any showing for Crazy Rich Asians only (except Tuesdays). OATH is the independent administrative law court where nearly all City enforcement agencies file their summonses for hearings. 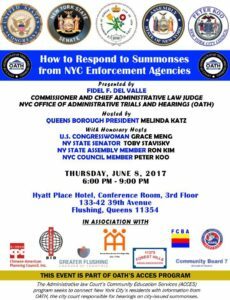 The agencies that file summonses at OATH for hearings includes the Departments of Sanitation, Buildings, Health, Parks, Environmental Protection, Consumer Affairs, FDNY and NYPD, among many others. On average, 40% of summonses that are fought at OATH hearings are dismissed by OATH Hearing Officers. The month of May is National Asian American & Pacific Islander Heritage Month (a/k/a Asian Pacific American Heritage month) and also National Military Appreciation Month (NMAM). The FHAA will be participating in various community events during the month and invite you to join us. 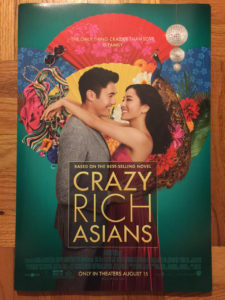 Some are to celebrate National Asian American & Pacific Islander Heritage Month (a/k/a Asian Pacific American Heritage month) and Military Appreciation Month . Others are to encourage participation and support for community organizations and partners. Please join us. 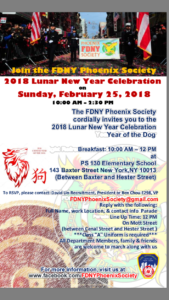 Or go to Eventbrite.com/ and type in FDNY Phoenix Society. Dinner Ticket sales ends: Friday, May 4, 2018. Can’t attend, buy a journal ad. Meet your neighbors and fellow supporters including the American Legion, Forest Hills Kiwanis, businesses and individuals, for the annual Forest Hills Memorial Day parade cocktail party / fundraiser where the Grand Marshalls will be announced. Tickets are $25 and includes finger foods and a free drink. Your sponsorship of $100, $250, $500 or $1000 (gold sponsor) helps to offset the cost of the bands, permits, transportation for various groups, etc. If you have questions on sponsoring , bringing a group to march, or volunteering, contact Commander Tom Long at 718-520-8623. Email FHAA11375@gmail.com if you plan to attend. Email FHAA11375@gmail.com if you plan to attend. 5. 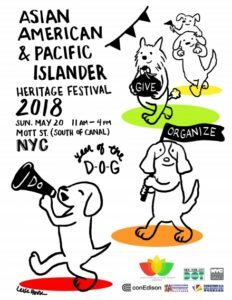 Sunday, May 20th, 11am-4pm – on Mott Street , south of Canal street, Manhattan, NYC. Asian American and Pacific Islander Heritage Month a/k/a Asian Pacific American Heritage Festival. 6. Saturday, May 26th ,12pm-6pm, Forest Hills Volunteer Ambulance Corp (FHVAC) EMS day and open house, 92-29 Metropolitan Ave, Forest Hills, NY . 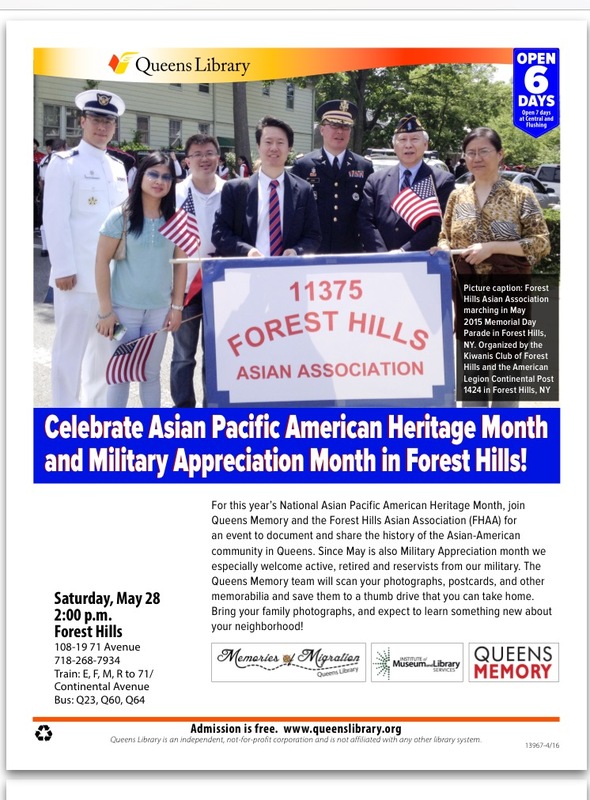 For this year’s National Asian Pacific American Heritage Month, join Queens Memory and the Forest Hills Asian Association (FHAA) for an event to explore the history of the Asian-American community in Queens. Artist EunWoo Nam (a/k/a UNO) will lead participants through an interactive drawing activity inspired by the personal migration stories shared by members of the community. This program celebrates the immigrant experience and builds empathy through storytelling and creative expression. This event was made possible in part by the Institute of Museum and Library Services grant . 8. 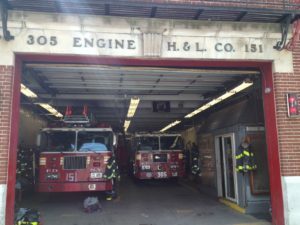 Sunday, May 27th, 2017, 12pm, Annual Forest Hills Memorial Day parade. Parade starts at Metropolitan Avenue and Ascan Avenue and continues West on Metropolitan towards Woodhaven Boulevard to Remsen Memorial Park at Trotting Course Lane. 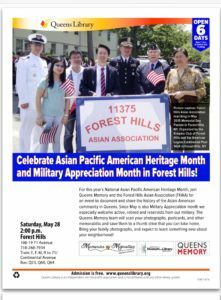 Join the Forest Hill Asian Association and other organizations to remember and honor the men and women who died while serving and also honor our active , reservists and retired military during Military Appreciation Month. We invite everyone to march with us including Asian American Veterans , reservists and active military and their families . Look for our FHAA banner. To march with the FHAA , email FHAA11375@gmail.com and meet in front of the American Legion at 11:30AM. Tuesday, March 6, 2018, 6pm-8pm. 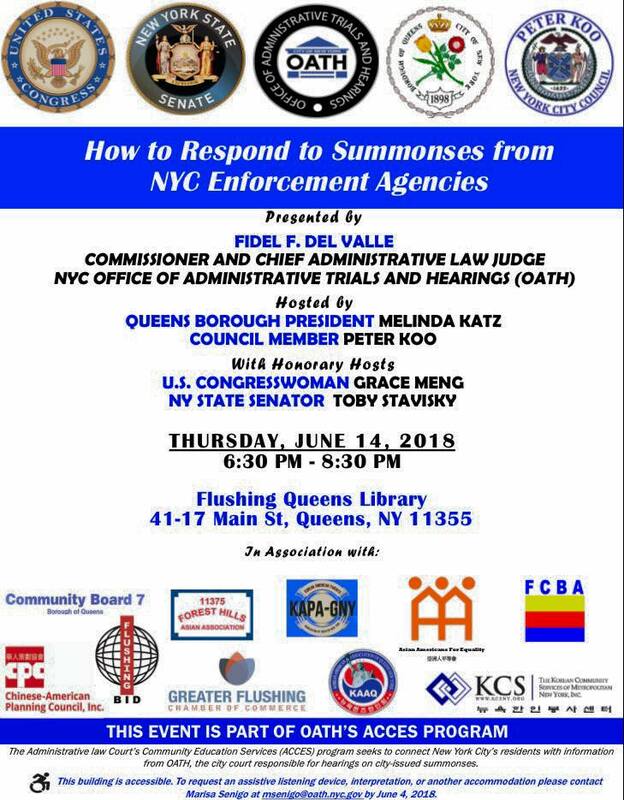 Flushing Chinese Business Assn, Forest Hills Asian Association, Foundation for Filipino Artists, Inc., Korean American Parents Association of Greater New York, In, Korean Community Services of Metropolitan New York, Inc. (KCS), East West Bank, Resorts World Casino New York City, Sinovision美国中文电视, The Korean Channel. Best wishes to all for the Year of the Dog! 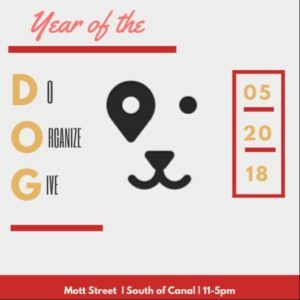 CELEBRATE THE LUNAR NEW YEAR OF THE DOG ! 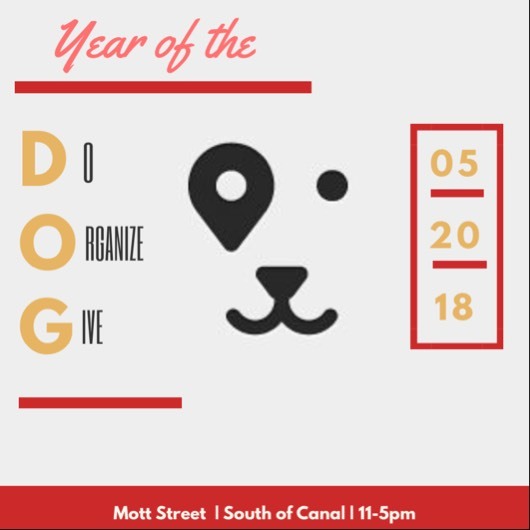 DOGS ARE WELCOME TO MARCH IN THE PARADES. 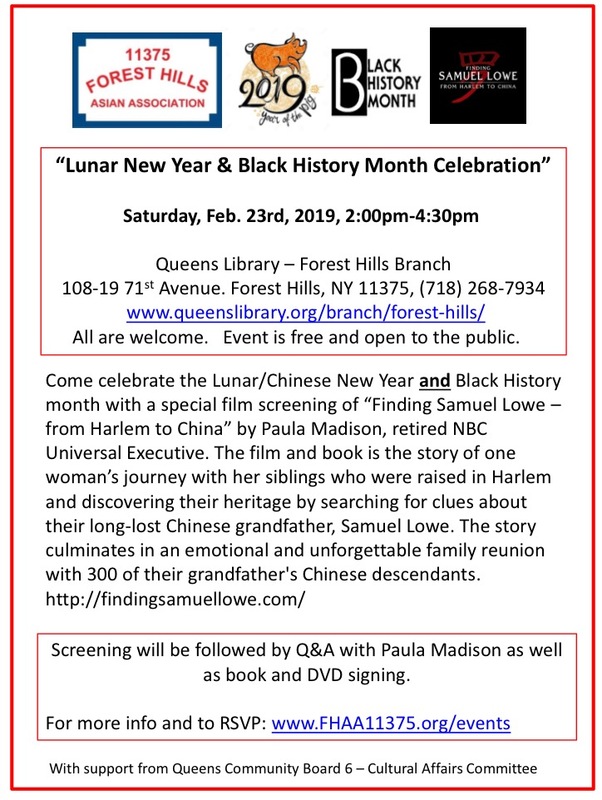 Thank you to the Queens Library Forest Hills Branch for inviting us to celebrate the Lunar / Chinese New Year of the Dog! 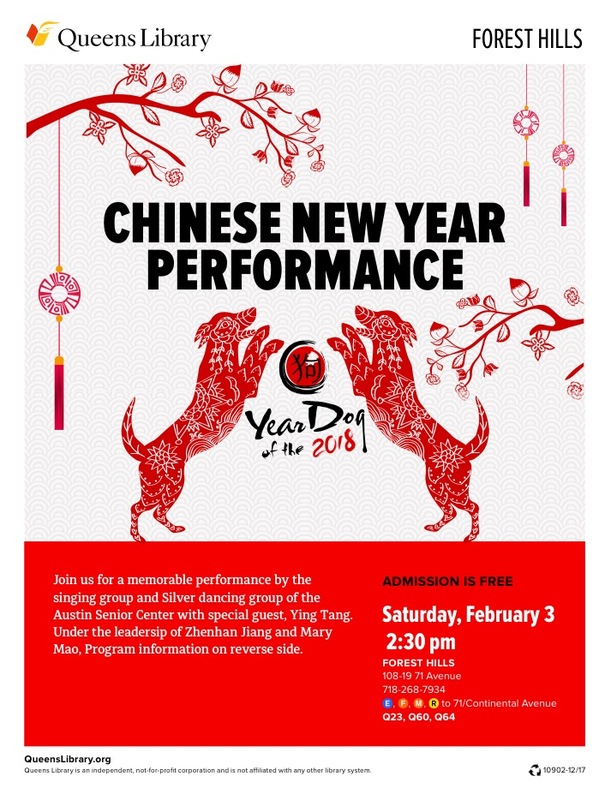 In efforts to increase awareness and support for local seniors, please come out to celebrate and watch a performance by the singing group and silver dancing group of the Austin Senior center with special guest , Ying Tang. 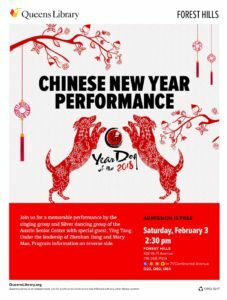 There will be music emsemble, chorus, solo singing performances, Chinese tai chi sword demonstration, and folk dance. 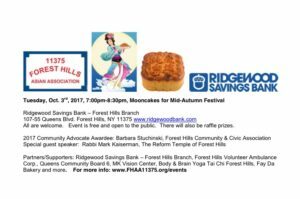 We will be tabling and distributing info about the Forest Hills Asian Association. We hope you can join us. 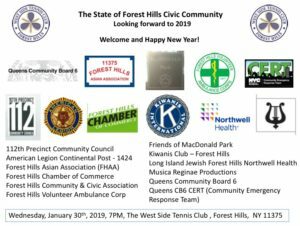 Come celebrate the New Year and learn more about various Forest Hills community organizations, their plans for 2018, and how to get involved. Elected officials who represent the community are also invited. – Michael Perlman, Author, “Legendary Locals of Forest Hills and Rego Park”. He will be joining us to personalize, sign and sell his book which can make a unique holiday gift. – Mr. Jia-Yi He, an award winning, world – class harmonica virtuoso will perform. He was on America’s Got Talent Season 5. 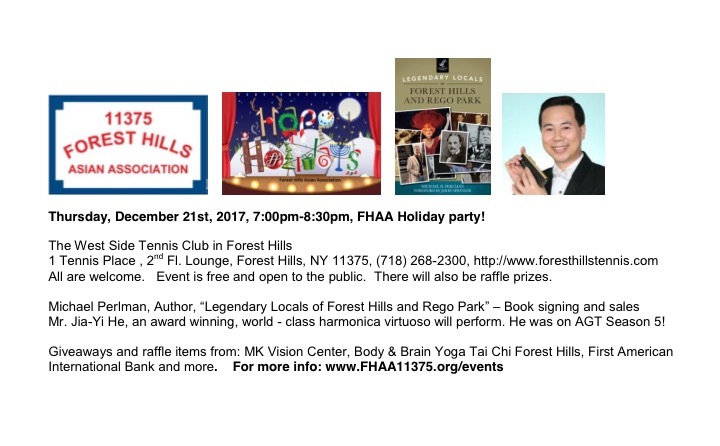 (http://agt.wikia.com/wiki/Jia-Yi_He ) and is included in “Legendary Locals of Forest Hills and Rego Park,” a book featuring over 200 notables (from unsung heroes to celebrities), interviews, local history, & memorable landmarks. Event is free and all are welcome to meet and mingle. Giveaways and raffles. FREE PARKING IS AVAILABLE IN CLUB MEMBERS LOT FOR THE EVENING. DO NOT PARK ON THE STREET AS THE STREET IS FOR RESIDENT PARKING ONLY. No RSVP is needed, but would be good to know and have an estimate. Meet and Greet Your neighbors, share ideas and get involved. Thank you to the Forest Hills Civic Association for inviting the FHAA to their holiday gathering. 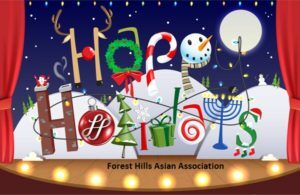 Look forward to celebrating the holiday season with you and our friends at the Forest Hills Civic Association . 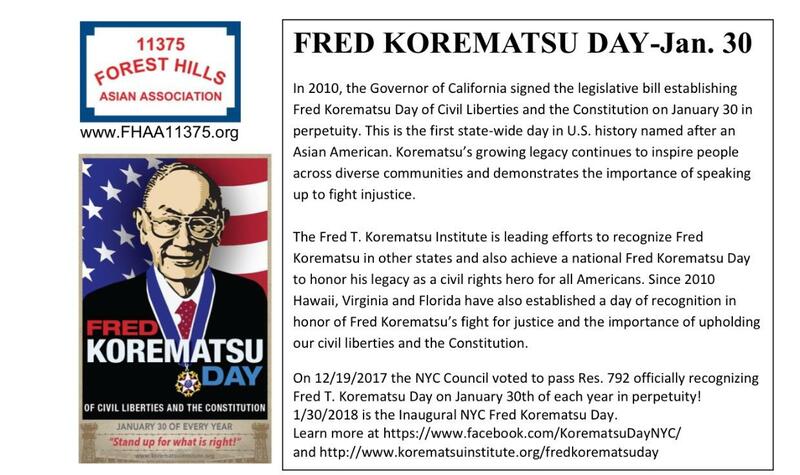 Please visit the Forest Hills Asian Association table at the upcoming Resource Fair for Advocacy Organizations on Thurs. 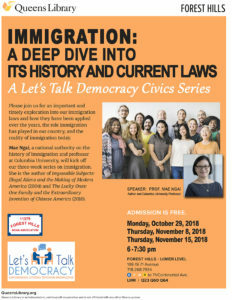 Nov. 16, 6pm-7:30pm, at Queens Library Forest Hills Library . Organized by It’s Who We Are (IWWA) in partnership with Taft Institute at Queens College, this event concludes a 7 week series of civic classes on how our government works. FHAA will have voter registration forms available , which are also available at the library. We hope to see you. Thank you to our venue host Ridgewood Savings Bank – Forest Hills. The building is located at the intersection of Queens Boulevard and 108th Street. Opened in 1940, the building was designated a New York City Landmark in 2000 by the New York City Landmarks Preservation Commission. Forest Hills Volunteer Ambulance Corp. will be on site again this year to check blood pressure for attendees. Mooncakes are generously provided by Fay Da Bakery. There will be raffle prizes as well from Ridgewood Savings Bank, MK Vision Center, Body & Brain Yoga Tai Chi Forest Hills and more. This year we will also have a cross cultural component to make the event unique. 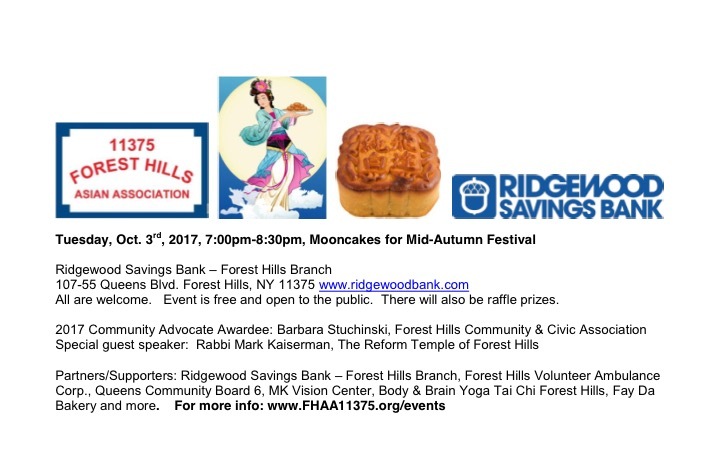 As September and October are also the timeframe for various Jewish Holy days including Yom Kippur, Rosh Hashanah and Sukkot, we are honored to invite and have as a special guest speaker : Rabbi Mark Kaiserman, from The Reform Temple of Forest Hills who will speak briefly on the Jewish High Holy days. So please join us to learn more and enjoy mooncakes and the Mid Autumn Festival! 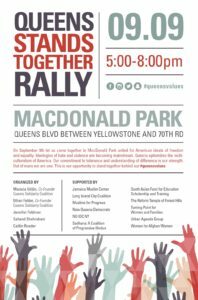 9.9.17 – Queens Stands Together Rally, Mac Donald Park, Forest Hills NY, 5pm -8pm. 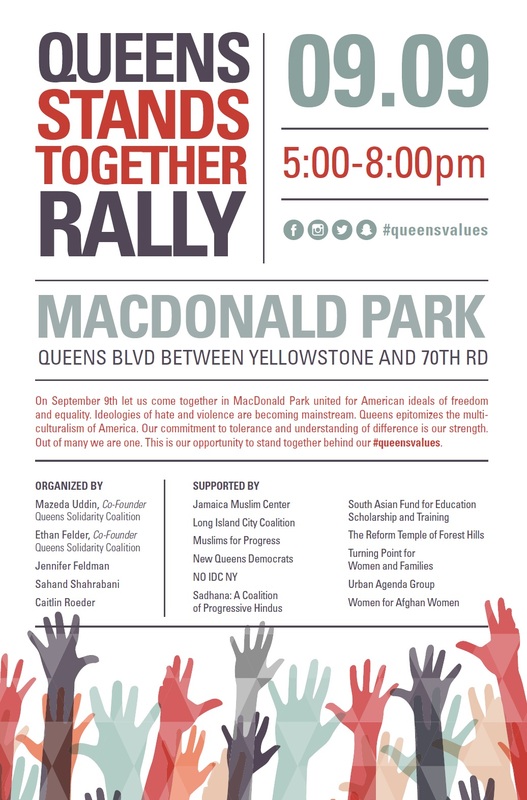 The FHAA will be joining other organizations for “Queens Stands Together Rally” on Saturday Sept. 9, 2017, 5pm -8pm at MacDonald Park, (Queens Blvd between Yellowstone Blvd. 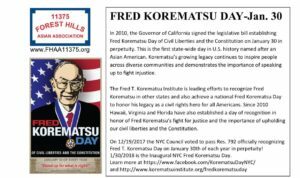 and 70th Rd) in Forest Hills, NYC united for American ideals of freedom and equality. Ideologies of hate and violence are becoming mainstream. Queens epitomizes the multi-culturalism of America. Our commitment to tolerance and understanding of difference is our strength. Out of many we are one. This is our opportunity to stand together behind our values. All are welcome. Event is free and open to the public. 9.10.17: 112th Pct Community Council Street Fair. Queens Blvd. Yellowstone and 70th Rd. 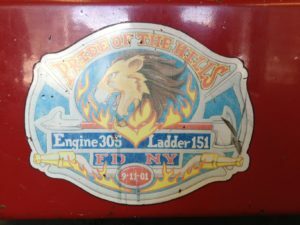 9.10.17 – “Run for Richie” Proceeds to benefit Forest Hills Volunteer Ambulance Corps. Dr. Rohan Arora, Director of the Stroke Program at LIJ Forest Hills will speak at 1:45pm at Queens Library, Forest Hills Branch, 108-19 71st Avenue, Forest Hills, NY. Admission is free. Thursday, June 8, 2017, 7pm. Doors open at 6pm and close at 7:30pm. lease RSVP to FHAA11375@gmail.com if you would like to join us. This is an opportunity for you to hear from the Mayor and ask questions. We thank the Mayor and his staff as well as our elected officials for hosting this event in our community. The month of May is National Asian American & Pacific Islander Heritage Month (a/k/a Asian Pacific American Heritage month) and also Military Appreciation Month. The Forest Hills Jewish Center – Crystal Room. 106-06 Queens Blvd. Forest Hills, NY 11375. 3. Sunday, May 21st, 11am-4pm – on Mott Street , south of Canal street, Manhattan, NYC. Asian American and Pacific Islander Heritage Month a/k/a Asian Pacific American Heritage Festival. For more info goto www.capaonline.org Look for the FHAA table and banner. Queens Borough President Melinda Katz‘s “Unity in Diversity” Rally on Sunday, March 5th at 4:00 PM on the front steps of Queens Borough Hall (120-55 Queens Blvd., Kew Gardens, NY 11424). Borough President Katz, along with faith & community leaders, immigrant advocates, elected officials, and Queens residents, will stand in solidarity as one borough to express pride in our diversity, to denounce the recent upsurge in hate crimes in several cities, and to acknowledge those who currently fear for the futures of their families. 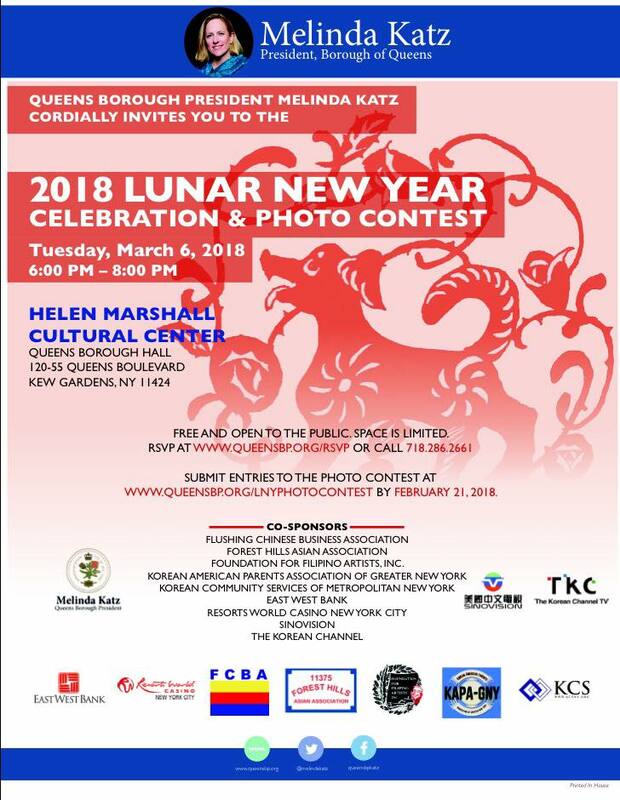 Queens Borough President Melinda Katz’s Lunar New Year Photo contest and celebration. The contest will be divided into two categories, one for high school students and the other for adults. The winner of each category will receive a $100 cash award. Deadline to submit photo entry is Feb. 15, 2017 at 5 PM. to www.queensbp.org/lnyphotocontest Contest winners will be notified of their wins by Feb. 21, 2017. 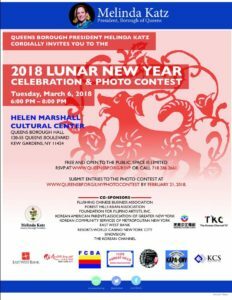 The winners will be announced during Queens Borough President Katz’s Lunar New Year celebration, which will be held Monday, Feb. 27, 2017 at 6 p.m. in the Helen Marshall Cultural Center at Queens Borough Hall, 120-55 Queens Boulevard, Kew Gardens. 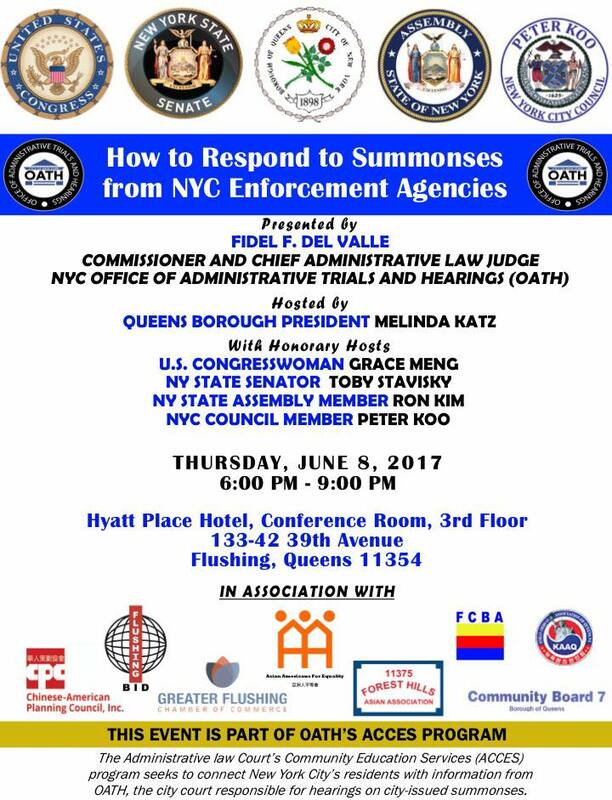 To attend, please RSVP to www.queensbp.org/rsvp or call 718-286-2784 (you can mention FHAA) We hope you can join us. 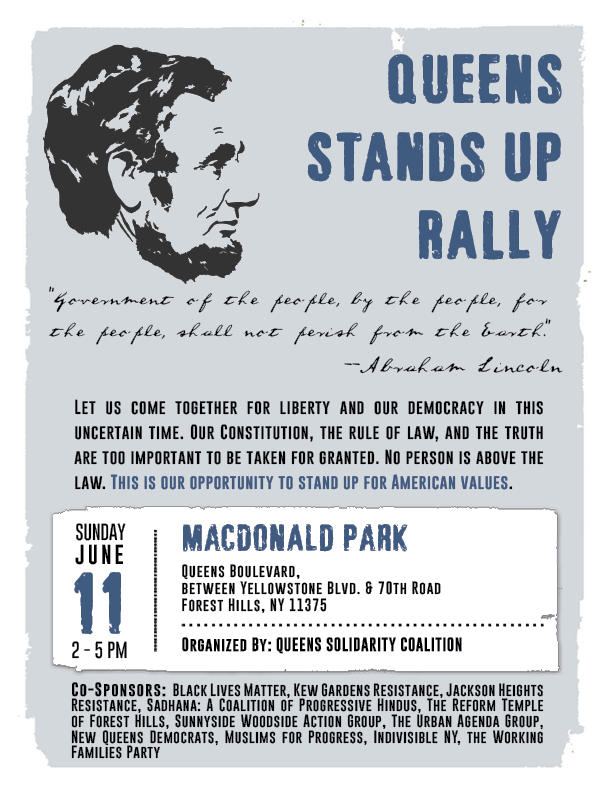 The Forest Hills Asian Association (FHAA) will be joining other organizations united for freedom and equality against bigotry, intolerance and hate at the “Queens Stands Together Rally” at MacDonald Park, in Forest Hills, Queens, NY on Sunday, Feb. 26, 2011, 11am-2pm. 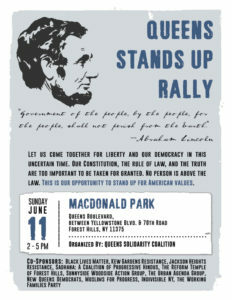 Organized by the Queens Coalition For Solidarity Forever. 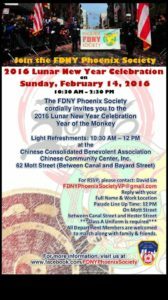 The FHAA is walking for the 2nd time in the Better Chinatown Society annual Manhattan Chinatown Lunar New Year Parade. We have been invited to join the FDNY Phoenix Society for a pre-parade breakfast gathering at PS 130 play room at 143 Baxter Street from 11am-12pm. 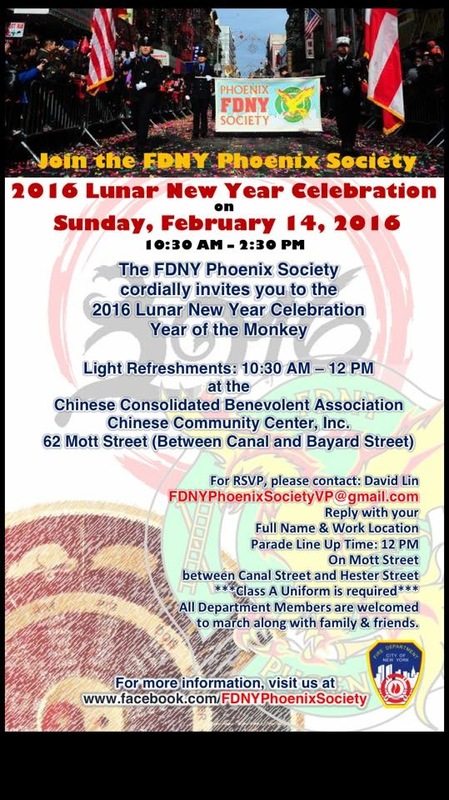 Then go line up for the parade between 12pm-1pm on Hester Street between Mott and Elizabeth Streets. Parade starts at 1pm. All are welcome to join us for both parades. Friends, family, colleagues, etc..
Wishing everyone good health and good fortune for the Year of the Rooster! Come celebrate the New Year and learn more about various Forest Hills community organizations, their plans for 2017, and how to get involved. Elected officials who represent the community are also invited. Learn more about our venue host The West Side Tennis Club. In existence since 1892, the West Side Tennis Club is the former site of The US Open and maintains 38 courts on four different surfaces. All are welcome to meet and mingle. Admission is free. Cheese crudité and crackers and Cash bar. FHAA has been allocated 20 seats in section 100 Level seating and 20 seats in Section 200 level seating . Deadline to purchase is Dec.16th or while supplies last . So don’t wait for the deadline . If your company or organization wants to purchase group discounted tickets for this game or any game , also contact Mark. 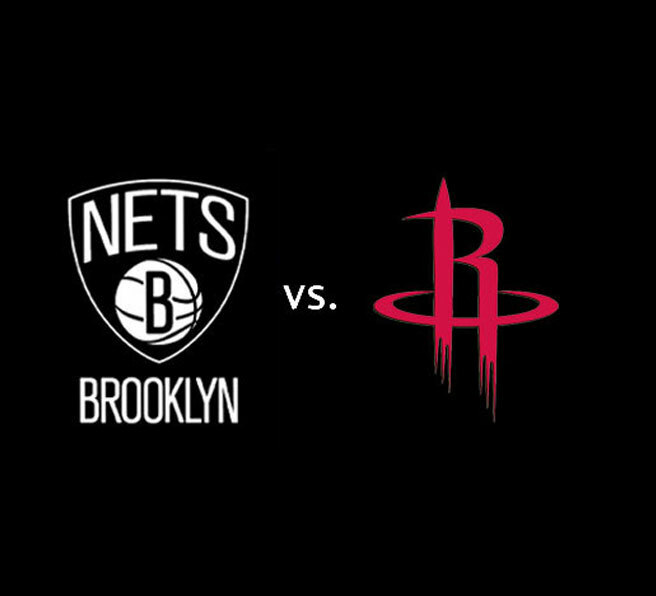 We look forward to you joining us and cheering on Jeremy Lin and the Brooklyn Nets! 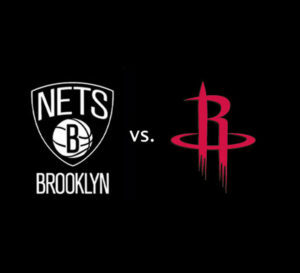 Come celebrate the holiday season, cheer on Jeremy Lin and the Brookyn Nets, explore the history of The West Side Tennis Club and learn about the benefits of membership. Meet Mario DiPreta, General Manager and CEO. In existence since 1892, the West Side Tennis Club is the former site of The US Open and maintains 38 courts on four different surfaces. Special guests from the FDNY Phoenix Society will share holiday season fire safety tips and information about the 2017 Firefighter exam. All are welcome to meet and mingle. Admission is free. Cash Bar and light snacks. Giveaways and raffles. Thank you to First American International Bank (FAIB) for donating 2017 calendars, MK Vision Center, Body and Brain Forest Hills Yoga and Tai Chi , and Bareburger Forest Hills for donating raffle items. More to be announced in the coming days. When his mother and two siblings first immigrated from Hong Kong to Los Angeles in the early 1980s, six-year-old Alvin was forced to stay behind with his working, and consequently absent, father. Upon Alvin and his father’s later arrival to America, the dream of reunification shattered under circumstances the filmmaker has yet to fully comprehend today. In his search for answers and closure, Tsang turns the camera on his family’s own narrative. English and Cantonese with English subtitles | 85 min. 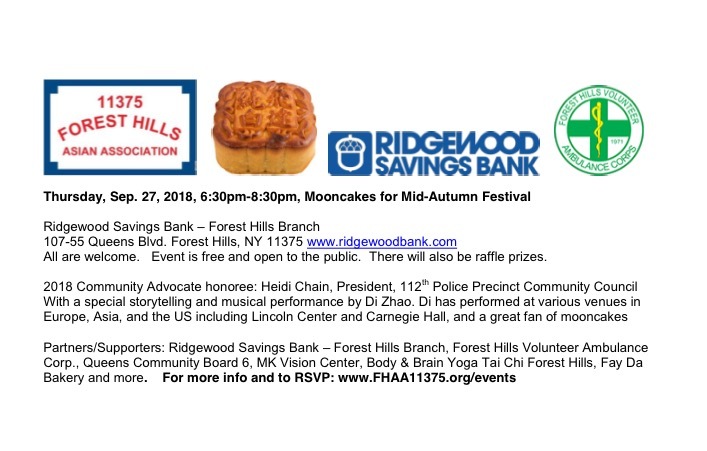 Join the FHAA as we celebrate the Mid-Autumn Festival with mooncakes and honor City Council Member Karen Koslowitz with our Inaugural Community Advocate Award. 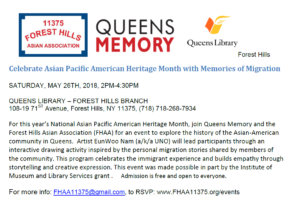 Join Queens Memory and the Forest Hills Asian Association (FHAA) for an event to document and share the history of the Asian-American community in Queens. Since May is also Military Appreciation month, we especially welcome active, retired and reservists from our military. . The Queens Memory team will scan your photographs, postcards, and other memorabilia and save them to a thumb drive that you can take home. Bring your family photographs, and expect to learn something new about your neighborhood! 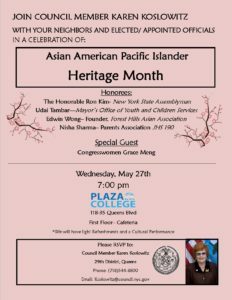 There will also be a photo exhibit by Asian American Photographer Laureate , Corky Lee , voter registration in partnership with OCA-New York Chapter – Asian Pacific American advocates. Complimentary popcorn from KETTLE CORN NYC and giveaways from Ridgewood Savings Bank Forest Hills Branch. 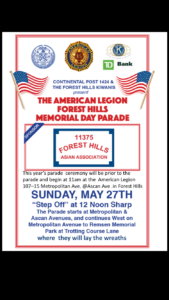 Sunday, May 29th, 2016, 12noon , Forest Hills Memorial Day Parade, ( starts at Metropolitan & Ascan Avenues, and continues West on Metropolitan to Remsen Memorial Park at Trotting Course Lane) ( meet at 11:30am in front of the American legion on 107-15 Metropolitan Ave (off Ascan Ave) Look for our red , white and blue banner. Organized by Kiwanis Club Forest Hills and The American Legion Continental Post 1424. 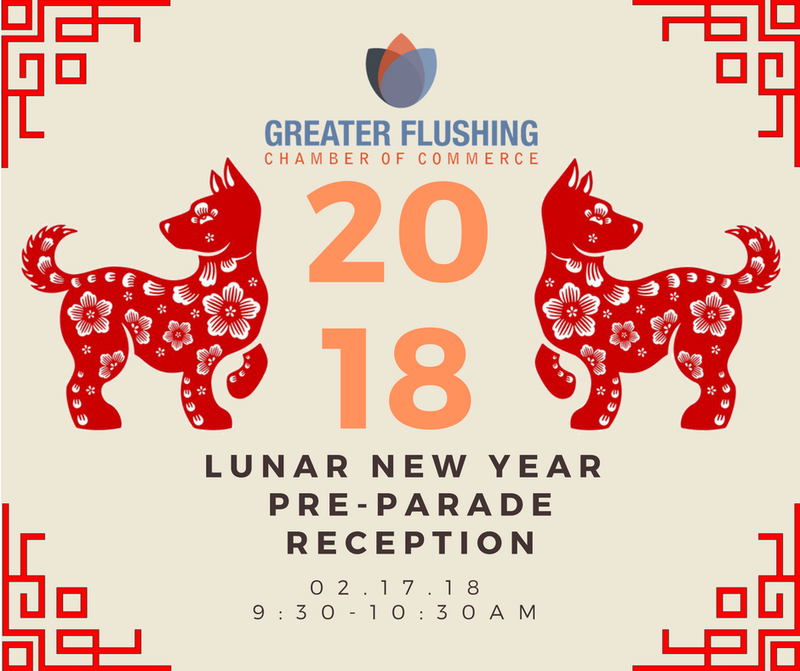 Join the FHAA as we march in the annual parade for the second year. Hear from panelists discuss the importance of getting engaged in your community, why you should become more involved and where to start. Thank you to our venue host The American Legion Continental Post 1424, Barbara Stuchinski and JR Nocerino . 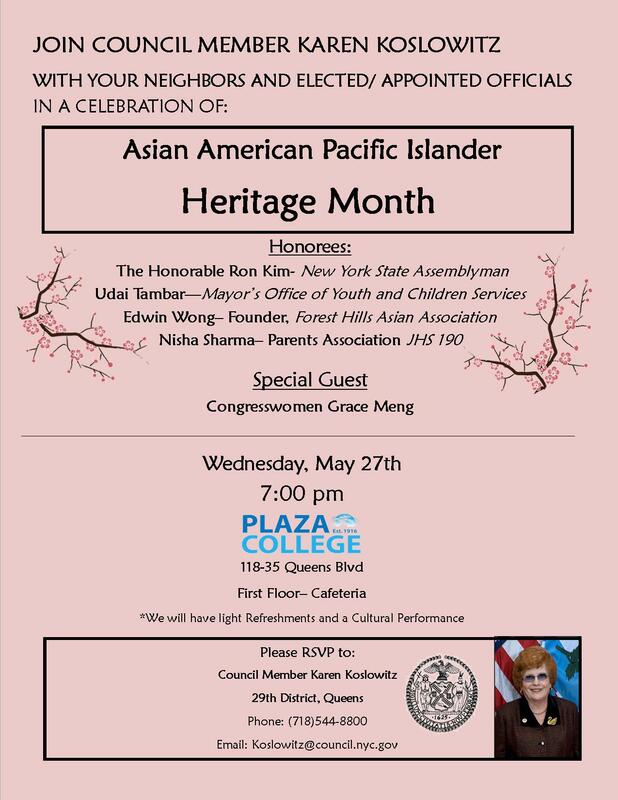 This event is part of the May 2016 Forest Hills Asian Association National Asian American & Pacific Islander Heritage month programs. Save these dates for FHAA May events and partner events to celebrate National Asian American & Pacific Islander Heritage Month (a/k/a Asian Pacific American Heritage month) and Military Appreciation Month . All events are free and open to everyone. Join the FHAA with the Earth Citizens Club at Ehrenreich-Austin Playground to celebrate moms and Mother Earth, as well as heighten awareness of Asian-Pacific Islander Heritage Month! Come participate in an Outdoor Yoga & Meditation Class (feel free to bring a mat or a towel), followed by booths and activities suitable for all ages including Origami Flower-making, Mother’s Day cards with Calligraphy, Story-telling with the Queens Bookshop, and a performance of “Puss in Boots” by the traveling puppet show PuppetMobile, sponsored by the City Parks Foundation. FHAA is a community marketing partner. Join the FHAA and the Friends of MacDonald Park and NYC Parks staff at a Tree and Shrub planting. This is part of a city-wide parks equity initiative funded largely by our NYC Council. It’s a big task so we will need even more volunteers to help make our park an even better place to visit! No experience necessary. Tools, gloves, and refreshments will be provided. Open to all ages. Students get community service credit too. Come out and see why this park is so important to our ever-changing neighborhood. FHAA is a community marketing partner. Musica Reginae Productions (MRP) presents Makoto Nakura and Barbara Podgurski in concert. Musica Reginae presents the return of Forest Hills resident and marimbist Makoto Nakura with Barbara Podgurski. This is the first night of the 5th annual Queens New Music Festival. FHAA is a community marketing partner. 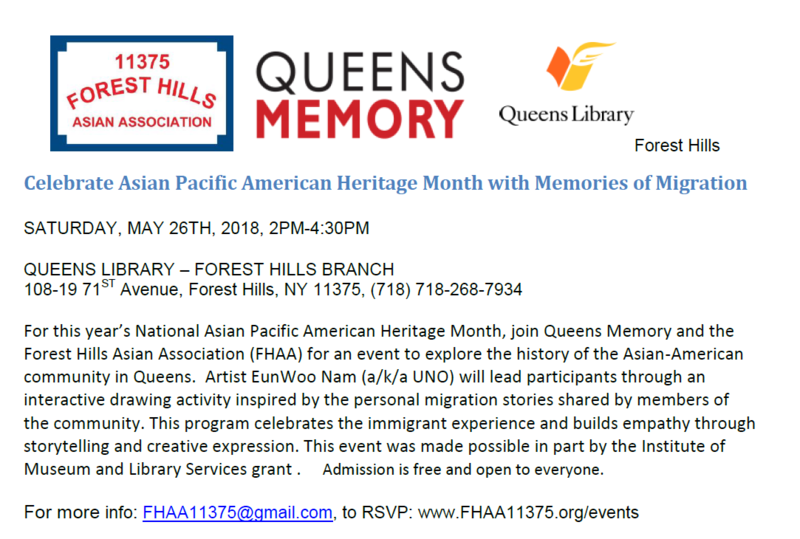 Join Queens Memory and the Forest Hills Asian Association (FHAA) for an event to document and share the history of the Asian-American community in Queens. Since May is also Military Appreciation month, we especially welcome active, retired and reservists from our military. . The Queens Memory team will scan your photographs, postcards, and other memorabilia and save them to a thumb drive that you can take home. 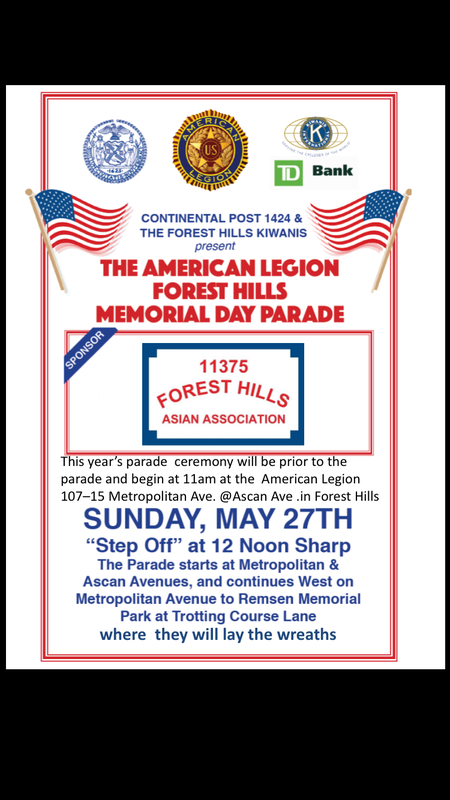 Sunday, May 29th, 2016, 12noon , Forest Hills Memorial Day Parade, ( starts at Metropolitan & Ascan Avenues, and continues West on Metropolitan to Remsen Memorial Park at Trotting Course Lane) Organized by Kiwanis Club Forest Hills and The American Legion Continental Post 1424. 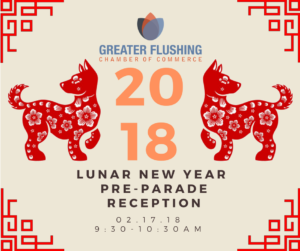 Join the FHAA as we march in the annual parade for the second year. Join us for a special Monday “Dumpling night” as we welcome the spring season and share upcoming May events for National Asian American and Pacific Islander Heritage month (a/k/a Asian Pacific American Heritage Month) and Military Appreciation Month. 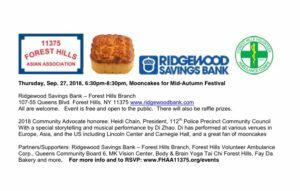 Meet other members, learn more about how to get involved and support a local Forest Hills restaurant! Thank you to Eve and the Rove team for preparing a special “FHAA Dumpling Platter” You will have to come and find out what’s in it! Train: E, F, M, R to 71st / Continental Ave. Admission is free. Cash bar with beer and wine happy hour specials from 3pm-8pm. Dumpling prices vary. There will be vegetarian options. 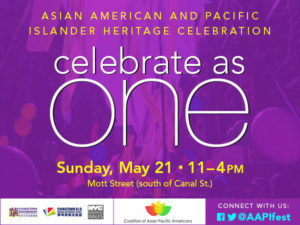 Celebrate the Asian American Community in Queens. 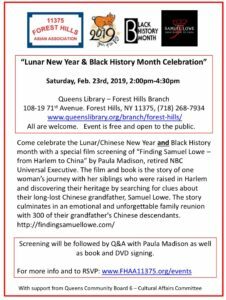 This Lunar New Year join the Forest Hills Asian Association (FHAA) and Queens Memory for an event to document and share the history of the Asian American community in Queens. The Queens Memory team will scan your photographs, postcards, and other memorabilia and save them to a thumb drive that you can take home. Bring your family photographs, and expect to learn something new about your neighborhood! Special thank you to Queens Library Forest Hills Branch and the Queens Memory team. 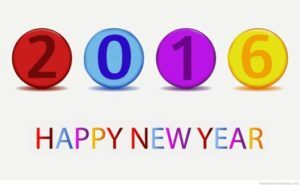 Come celebrate the New Year and learn more about various Forest Hills community organizations, their plans for 2016, and how to get involved. Elected officials who represent the community are also invited. Learn more about our venue host The West Side Tennis Club. In existence since 1892, the West Side Tennis Club is the former site of The US Open and maintains 38 courts on four different surfaces. – 2016 New York City Parking Calendars (for alternate side parking / street cleaning rules and major legal holiday rules) compliments of Assemblyman Andrew Hevesi. – Map and guide of Flushing Meadows Corona Park compliments of the Flushing Meadows Corona Park Conservancy. Publication produced by Partnerships for Parks, a joint program of City Parks Foundation and NYC Parks. Come celebrate the holiday season and explore the history of The West Side Tennis Club and learn about the benefits of membership. Meet Mario DiPreta, General Manager and CEO. In existence since 1892, the West Side Tennis Club is the former site of The US Open and maintains 38 courts on four different surfaces. All are welcome to meet and mingle. Admission is free. Cash Bar and light snacks. Giveaways, raffles and silent auction. FREE PARKING IS AVAILABLE IN CLUB MEMBERS LOT FOR THE EVENING. DO NOT PARK ON THE STREET AS THE STREET IS FOR RESIDENT PARKING ONLY. General Meeting to Celebrate Filipino American History Month and Halloween. Come learn about Filipino American History Month. Stay after the meeting and join the Queens Library, Forest Hills branch and Celebrate the Filipino Community in Queens with Queens Memory and My Baryo, My Borough. My Baryo, My Borough uses oral history interviews to document your stories. The Queens Memory team will scan your photographs, postcards, and other memorabilia and save them to a thumb drive that you can take home. Bring your materials and memories and expect to learn something new about your community. Admission is free. Since it’s Halloween, feel free to attend in a festive costume. Learn more about how to get involved with the FHAA and celebrate the Mid-Autumn Festival. The FHAA will be at the Queens Library Forest Hills location from 1:30pm-5:30pm registering new voters. Additional registration dates on Sat. Sep. 19th at Forest Hills library and Sun. Sep. 20th at Bramson ORT College. 1pm-5pm on both days. Please email FHAA11375@gmail.com if you would like to volunteer to table and register new voters. – Tuesday, Sep. 15, 6 PM. APIA Vote, Taste of Democracy reception in NYC, Supporting AAPI Voter Engagement, Latham & Watkins, 885 3rd Ave. NY NY. Featuraing special guest: Congresswoman Grace Meng. FHAA will participate at the “Constituent Level” for not for profits. 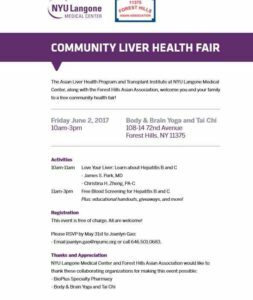 Please register at http://j.mp/TasteNYC and on the bottom, select “Invited by: Forest Hills Asian Association” Event is open to everyone. Please email FHAA11375@gmail.com after registering so we can gather as a group at the reception. SAVE THE DATE – MONDAY, JULY 27, 2015, 7pm. 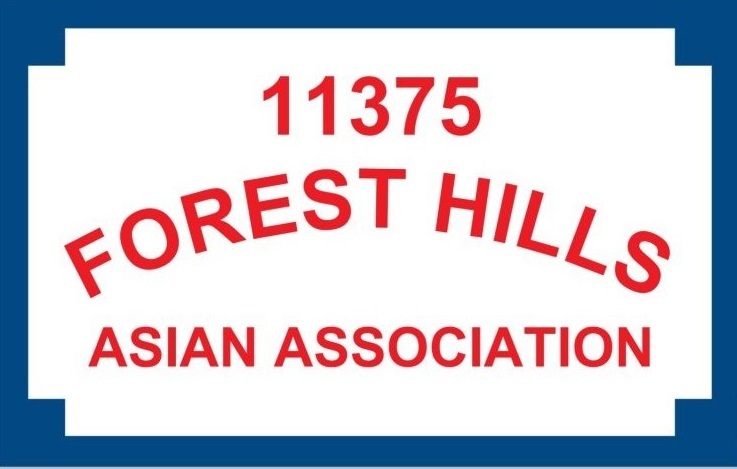 Please join the Forest Hills Asian Association (FHAA) leadership team as we invite representatives of various Forest Hills community organizations as well as elected officials who represent Forest Hills to meet with our members and to share information about their organizations. 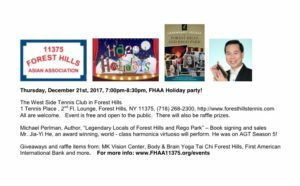 Come learn more about upcoming events in Forest Hills and how to volunteer and get involved in organizing upcoming events for the FHAA. 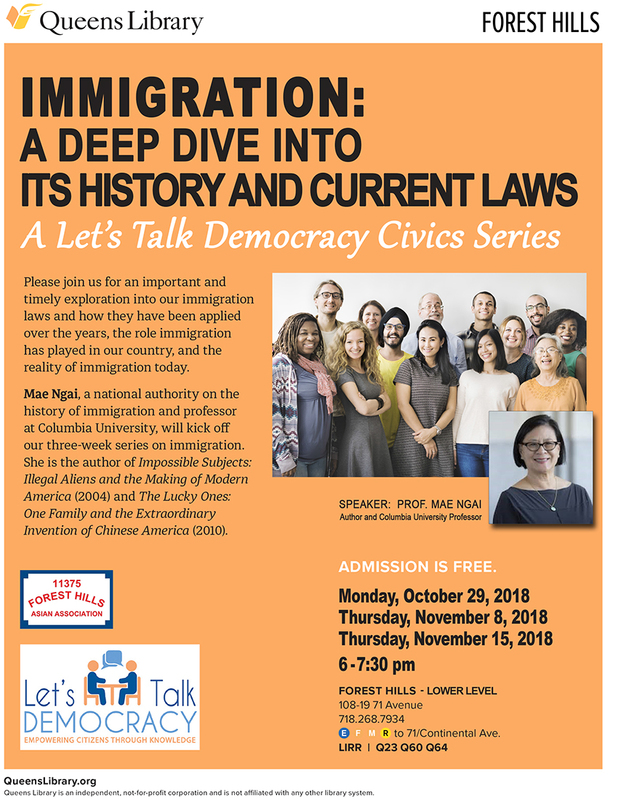 Hear from panelists that work in government for an elected official on their experiences and what they feel are actions and initiatives that could support efforts to encourage Asian Americans to become more involved in the political process. For example, educational seminars about election process, importance of voter registration and why voting matters, finding employment opportunities. We will be joining other volunteers to give MacDonald Park some TLC. Help clean, plant, paint, rake, trim, mulch, maintain tree pits, and prepare new planting grounds. No experience necessary. Open to all ages. School credit available. Pitch in for as long as you wish. All supplies and gloves will be provided. 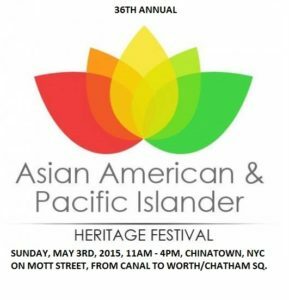 Sunday, May 3rd, 11AM–4PM, Manhattan Chinatown, NYC. Learn how to get involved and share ideas. We are planning May events and activities to celebrate National Asian Pacific American Heritage Month. We will also plan to show the most recent episode of “Fresh off the Boat” after the general meeting. If you cannot make the meeting and have ideas that you want to take the lead on, please email FHAA11375@gmail.com. We look forward to your participation. 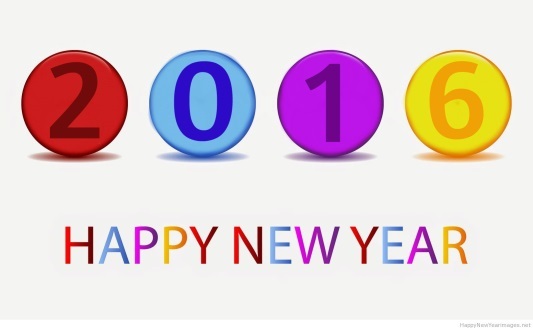 For businesses, families, professionals, seniors, all residents and friends of the Forest Hills community. Come meet, mingle, and share ideas on how we can all partner, advocate and collaborate in 2015. Feel free to invite a guest(s). There is no cost to attend. Cash bar HH specials. Complimentary light appetizers. Raffle drawing for local merchant discounts , gift cards, and more. Thank you to MK Vision Center, First American International Bank (FAIB) and Bare Burger for their raffle prizes. More to be announced.